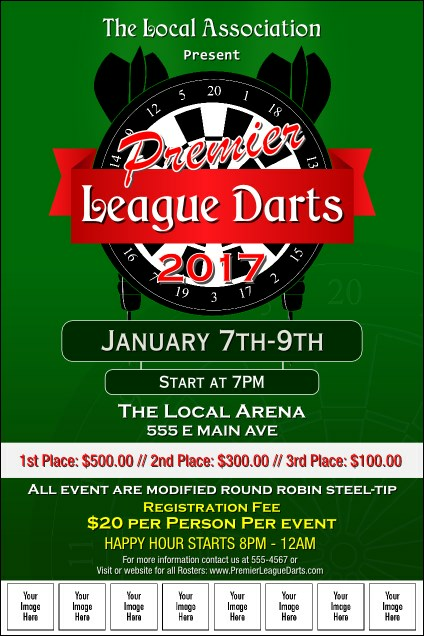 Enthusiasts, players, and fans will gather at your tournament when you promote it well in advance using the Premier League Darts 2017 Image Poster! Centered with a sharp black and white board backed by oversized darts, this template’s green background showcases your event’s particulars in standout white, red and yellow text. Spotlight sponsors using its eight custom image upload spots! Pre-event marketing is essential to drawing a crowd! Incorporate custom printed TicketPrinting.com posters into your marketing strategy.